**New FALL CLASS SCHEDULE IS UP! CLICK ON CLASSES IN TOP MENU! The background Designer Series Paper is from Candy Cane Lane - one of the more generic patterns which felt to me like a gentle snow fall. When you die cut the fir twigs in different colours of green you get more depth and definition than just using a single colour. Here I used Emerald Envy, Garden Green and Cucumber Crush. I love how easy the Pretty Pine Thinlits are to use as well. I didn't have to use my Precision Base Plate with these. They cut easily and easily removed from the dies as well. This is great for me as a demonstrator, because when I use this design in my next Technique class, I won't have to have my customers using the Precision Plate over and over and wreaking havoc on yet another cutting pad! I keep all my old cutting pads for just that purpose, but it's nice not to worry about it. 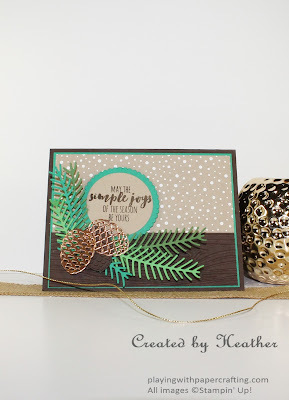 Love, love, love the Copper Foil Sheets and the three different designs for pinecones that are in the set. I'm thinking that they can be layered for a different look, but here I used them separately. The Copper foil makes them just stunning! I added some woodgrain texture with the bottom panel of Early Espresso to be a dark background to show off the fir branches and cones to the best advantage. 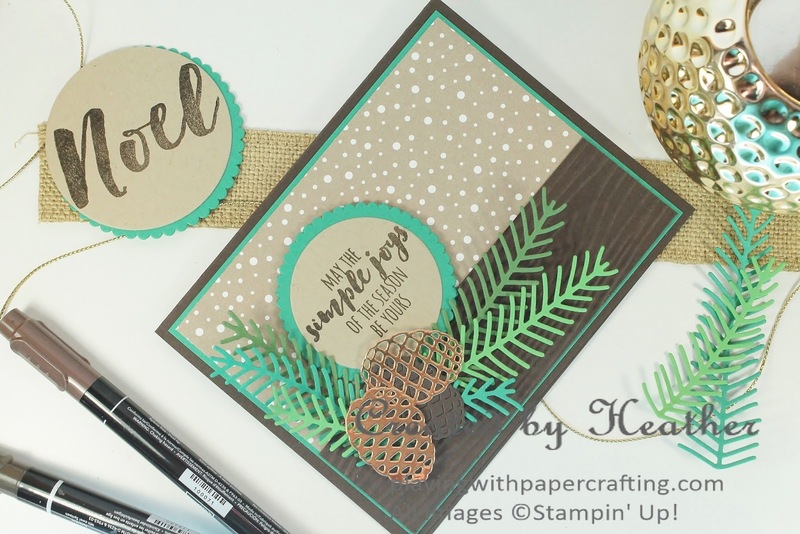 The sentiment is from the coordinating stamp set, Christmas Pines, and it's stamped in Early Espresso ink, and die cut and backed with shapes from the Layering Circles Framelits! I have to say, I use these framelits far more than I ever did the old Circles Collection Framelits. They are much more useful. 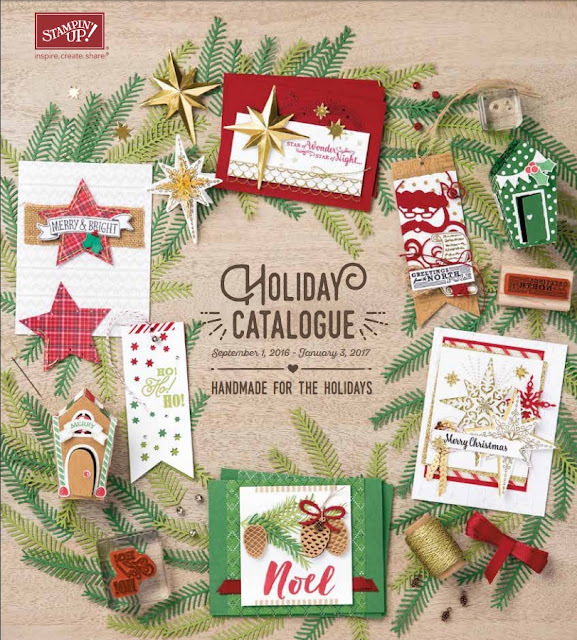 This catalogue is live now and you can order from it until January 3, 2017!